7am on a freezing morning, a 3 years old little girl was seen helping the street cleaner sweep fallen leaves in Changchun City, Jilin Province. 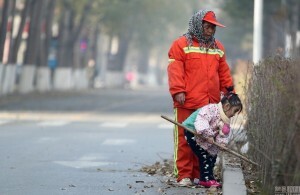 The street cleaner is called Lv Shuying, and the little helper is her grand daughter Yingying. (From Xian Xiang Morning News) Yesterday, a photo named “Little brother needs to sleep” got retweeted almost 1000 times within one hour on QQ weibo (and the number mounts to 6962 within 24 hours). 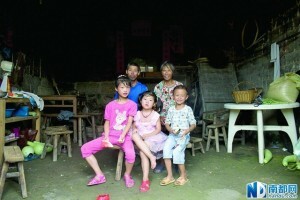 Many netizens were moved by the little girl’s love for her baby brother, and some offered to donate money.